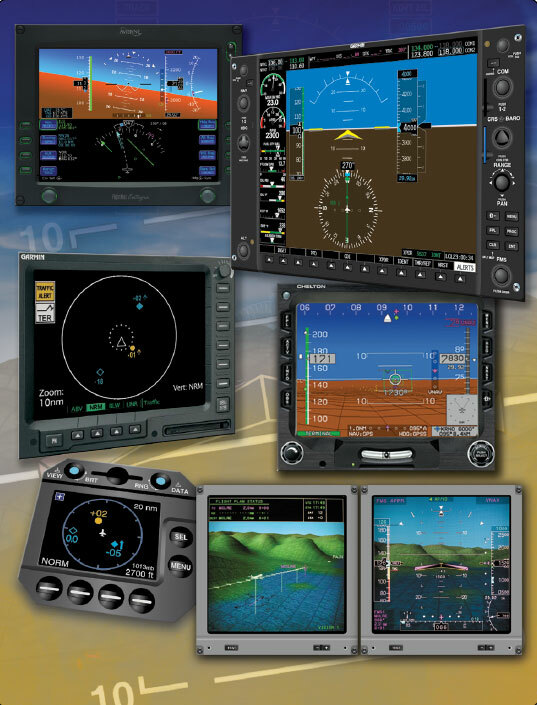 In the GA community, an automated aircraft is generally comprised of an integrated advanced avionics system consisting of a primary flight display (PFD), a multifunction flight display (MFD) including an instrument-certified global positioning system (GPS) with traffic and terrain graphics, and a fully integrated autopilot. This type of aircraft is commonly known as a technically advanced aircraft (TAA). 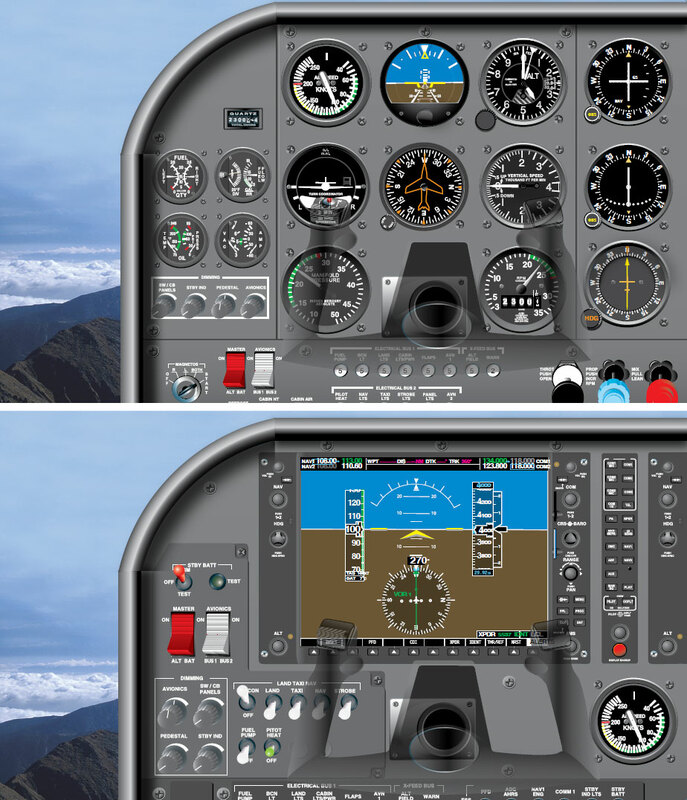 In a TAA aircraft, there are typically two display (computer) screens: PFD (left display screen) and MFD. Figure 2-21. Electronic flight instrumentation comes in many systems and provides a myriad of information to the pilot. MFDs are capable of displaying moving maps that mirror sectional charts. These detailed displays depict all airspace, including Temporary Flight Restrictions (TFRs). MFDs are so descriptive that many pilots fall into the trap of relying solely on the moving maps for navigation. Pilots also draw upon the database to familiarize themselves with departure and destination airport information. More pilots now rely on electronic databases for flight planning and use automated flight planning tools rather than planning the flight by the traditional methods of laying out charts, drawing the course, identifying navigation points (assuming a VFR flight), and using the POH to figure out the weight and balance and performance charts. Whichever method a pilot chooses to plan a flight, it is important to remember to check and confirm calculations. Always remember that it is up to the pilot to maintain basic airmanship skills and use those skills often to maintain proficiency in all tasks. This reliance on automation translates into a lack of basic flying skills that may affect the pilot’s ability to cope with an in-flight emergency, such as sudden mechanical failure. The worry that pilots are becoming too reliant on automated systems and are not being encouraged or trained to fly manually has grown with the increase in the number of MFD flight decks. A major study was conducted to evaluate the performance of two groups of pilots. The control group was composed of pilots who flew an older version of a common twin-jet airliner equipped with analog instrumentation and the experimental group was composed of pilots who flew the same aircraft, but newer models equipped with an electronic flight instrument system (EFIS) and a flight management system (FMS). The pilots were evaluated in maintaining aircraft parameters, such as heading, altitude, airspeed, glideslope, and localizer deviations, as well as pilot control inputs. These were recorded during a variety of normal, abnormal, and emergency maneuvers during 4 hours of simulator sessions. When pilots who had flown EFIS for several years were required to fly various maneuvers manually, the aircraft parameters and flight control inputs clearly showed some erosion of flying skills. During normal maneuvers, such as turns to headings without a flight director, the EFIS group exhibited somewhat greater deviations than the analog group. Most of the time, the deviations were within the practical test standards (PTS), but the pilots definitely did not keep on the localizer and glideslope as smoothly as the analog group. Another situation used in the simulator experiment reflected real world changes in approach that are common and can be assigned on short notice. Once again, the analog crews transitioned more easily to the parallel runway’s localizer, whereas the EFIS crews had a much more difficult time with the pilot going head down for a significant amount of time trying to program the new approach into the FMS. Emergency maneuvers clearly broadened the difference in manual flying skills between the two groups. In general, the analog pilots tended to fly raw data, so when they were given an emergency, such as an engine failure, and were instructed to fly the maneuver without a flight director, they performed it expertly. By contrast, SOP for EFIS operations at the time was to use the flight director. When EFIS crews had their flight directors disabled, their eye scan again began a more erratic searching pattern and their manual flying subsequently suffered. Pilots must maintain their flight skills and ability to maneuver aircraft manually within the standards set forth in the PTS. It is recommended that pilots of automated aircraft occasionally disengage the automation and manually fly the aircraft to maintain stick-and-rudder proficiency. It is imperative that the pilots understand that the EFD adds to the overall quality of the flight experience, but it can also lead to catastrophe if not utilized properly. At no time is the moving map meant to substitute for a VFR sectional or low altitude en route chart.